Know how to do machine learning with Microsoft technologies. This book teaches you to do predictive, descriptive, and prescriptive analyses with Microsoft Power BI, Azure Data Lake, SQL Server, Stream Analytics, Azure Databricks, HD Insight, and more.The ability to analyze massive amounts of real-time data and predict future behavior of an organization is critical to its long-term success. Data science, and more specifically machine learning (ML), is today’s game changer and should be a key building block in every company’s strategy. Managing a machine learning process from business understanding, data acquisition and cleaning, modeling, and deployment in each tool is a valuable skill set. Machine Learning with Microsoft Technologies is a demo-driven book that explains how to do machine learning with Microsoft technologies. You will gain valuable insight into designing the best architecture for development, sharing, and deploying a machine learning solution. 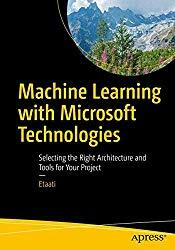 This book simplifies the process of choosing the right architecture and tools for doing machine learning based on your specific infrastructure needs and requirements. Detailed content is provided on the main algorithms for supervised and unsupervised machine learning and examples show ML practices using both R and Python languages, the main languages inside Microsoft technologies. What You'll Learn Choose the right Microsoft product for your machine learning solutionCreate and manage Microsoft’s tool environments for development, testing, and production of a machine learning projectImplement and deploy supervised and unsupervised learning in Microsoft products Set up Microsoft Power BI, Azure Data Lake, SQL Server, Stream Analytics, Azure Databricks, and HD Insight to perform machine learning Set up a data science virtual machine and test-drive installed tools, such as Azure ML Workbench, Azure ML Server Developer, Anaconda Python, Jupyter Notebook, Power BI Desktop, Cognitive Services, machine learning and data analytics tools, and more Architect a machine learning solution factoring in all aspects of self service, enterprise, deployment, and sharingWho This Book Is ForData scientists, data analysts, developers, architects, and managers who want to leverage machine learning in their products, organization, and services, and make educated, cost-saving decisions about their ML architecture and tool set.